Have recent excavations provided more clues to the so called "Granaries"? What was their purpose? Prof. J. M. Kenoyer, who has recently investigated the Granary at Harappa, is the best person to answer these questions. My impression is that the evidence for the "Granaries" identification is quite flimsy; the type of dig made in the past, simply, was not accurate enough for such an identification, and the various theories so far proposed are pure conjectures. One of these is that the large compartmented building of Harappa was a weaving plant; I like the idea, but at present it is just another guess. Portions of the so-called “granary” area on the northern edge of Mound F at Harappa were re-excavated in the late 1990s by the Harappa Archaeological Research Project. No evidence indicating that grain or other foodstuffs were stored in this location was found at that time. It was clear, however, that some kind of large, specialized structure once existed at this location. That structure might have been a warehouse, a factory, meeting hall or some combination of any of these. 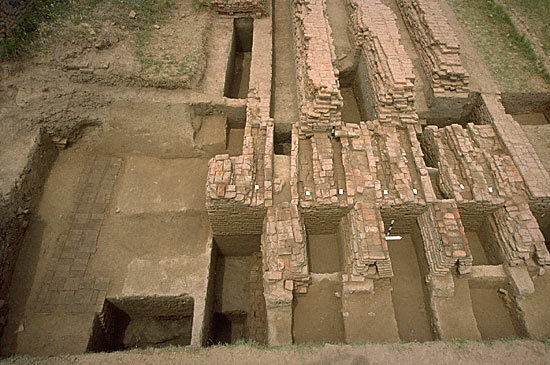 The recent excavations at Harappa suggest that the building that Vats referred to as a granary did not exist, at least in the place he had noted. Deep digging at the southeast corner of the "granary" at Harappa revealed an earlier building [wall 330] constructed along the same east-west alignment.